Physical processes taking place in micro/nanoscale strongly depend on the material types and can be very complicated. Known approaches include kinetic theory and quantum mechanics, non-equilibrium and irreversible thermodynamics, molecular dynamics, and/or fractal theory and fraction model. Due to innately different physical bases employed, different approaches may involve different physical properties in describing micro/nanoscale heat transport. In addition, the parameters involved in different approaches, may not be mutually inclusive. 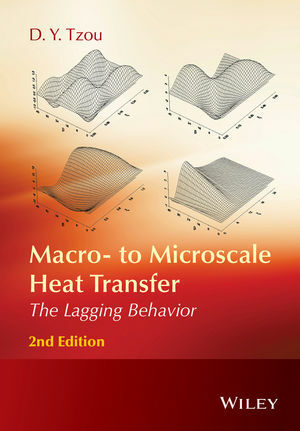 Macro- to Microscale Heat Transfer: The Lagging Behavior, Second Edition continues the well-received concept of thermal lagging through the revolutionary approach that focuses on the finite times required to complete the various physical processes in micro/nanoscale. Different physical processes in heat/mass transport imply different delay times, which are common regardless of the material type. The delay times, termed phase lags, are characteristics of materials. Therefore the dual-phase-lag model developed is able to describe eleven heat transfer models from macro to nanoscale in the same framework of thermal lagging. Recent extensions included are the lagging behavior in mass transport, as well as the nonlocal behavior in space, bearing the same merit of thermal lagging in time, in shrinking the ultrafast response down to the nanoscale. Macro- to Microscale Heat Transfer: The Lagging Behavior, Second Edition is a comprehensive reference for researchers and practitioners, and graduate students in mechanical, aerospace, biological and chemical engineering. D. Y. “Robert” Tzou is a James C. Dowell Professor of Engineering in the Mechanical and Aerospace Engineering Department at the University of Missouri. He served as the Department Chairman in 1997-2012, and has become the Associate Dean for Academic Programs in the College of Engineering since 2012. Tzou is a Fellow of American Society of Mechanical Engineers. His research is in the general area of ultrafast thermomechanics, in which he delivered keynote speeches at a number of national and international professional society conferences and published more than 150 journal/conference articles. His research has been financed by the National Science Foundation, the Air Force Office of Scientific Research, the Army Research Office, Sandia National Laboratories, Los Alamos National Laboratory and the Air Force Research Laboratory. Tzou has pioneered on the lagging behavior during ultrafast heat/mass transport in micro/nanoscale since 1997. He is the founding chair for the ASME International Conference on Micro/Nanoscale Heat Transfer, http://www.asmeconferences.org/MNHMT2013/Organizers.cfm. Tzou worked at the University of New Mexico and Lehigh University before joining the Missouri faculty.